It’s been simmering online for awhile now that far-left groups associated with Antifa are planning nationwide protests on November 4. If anyone shows up for the chaos they’re planning, there will be protesting and shouting and hitting and probably vandalism. We know this because those are the only things that are ever accomplished in these pointless gatherings. But in the textbook definition of projection, the people organizing these protests/riots are already blaming any violence that might occur on conservatives. The case-in-point is The Washington Post, who wrote a truly confounding article on the subject. For anyone logging time on the far right corners of the Internet, this coming Saturday is not just another autumn weekend but the potential start date of an apocalyptic showdown. What basically happened was that this activist group called the Revolutionary Communist Party set up November 4 as the date to begin what they envisioned as an Occupy Wall Street-style continuous protest that I guess is supposed to stop Trump from being so mean. A group called Refuse Fascism, which is apparently slightly less fringe, picked up on the idea and began coordinating nationwide protests for Saturday. 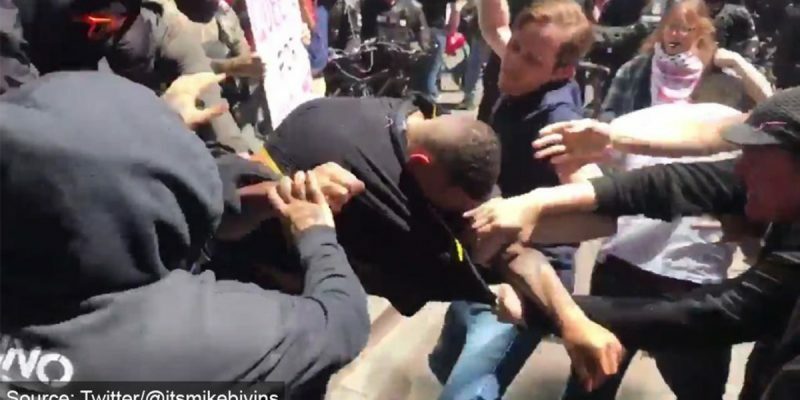 The guys at InfoWars covered the story as a violent attempt from the far-left to overthrow the government. A guy by the name of Andy Zee with Refuse Fascism came out after that and said the group is non-violent…until and until they’re threatened. Naturally the mainstream media covered this by calling the whole thing a conservative conspiracy theory, as well as an excuse for the far-right to engage in violence with the protesters. The idea of “Antifa” (short for anti-fascism) has become a fixture in America’s popular imagination in the wake of President Donald Trump’s election, albeit in a way that tends to have very little basis in reality. The group—which has no formal organizational structure, and is best defined as a tactic associated with protesting against the threat of fascism—has been falsely blamed for everything from the deadly mass shooting in Las Vegas to covert collaborations with the Islamic State militant group (ISIS). Now, “antifa” is apparently plotting a civil war in the United States that will begin on November 4, according to a pervasive right wing conspiracy theory. Well here’s the thing, we know these professional activists are getting more and more comfortable with bringing weapons to these events. We know these protests aren’t just a fabrication made up by Alex Jones, and judging by the history of similar protests we know that it could very easily turn violent depending on the turnout. We know Antifa and their ilk are happy to engage in violence and sell themselves on social media as victims. These groups start out non-violent, but their MO is provoking conservatives to hit them and then pretending like they were totally innocent. If looting, rioting, etc. does occur, they can now just say the conservatives did it and give a hearty I told you so. More than likely, the media will be more than happy with that and call it a day. But I actually doubt that there will be any armed violence at this thing. Austin and Atlanta both have local chapters set up to protest, but the number of people listed as going on their Facebook is kind of sad. If we’re lucky three people will show up in each city and we can all laugh about it. But in the off-chance that this becomes a thing we have to hear about everyday, I would advise any nearby conservatives to not give these dorks the attention they crave. Enjoy the weekend, spend the day with your family, have fun on a Saturday – even if it is the dreaded November 4. The only way to deal with these people is to ignore them until they go away.